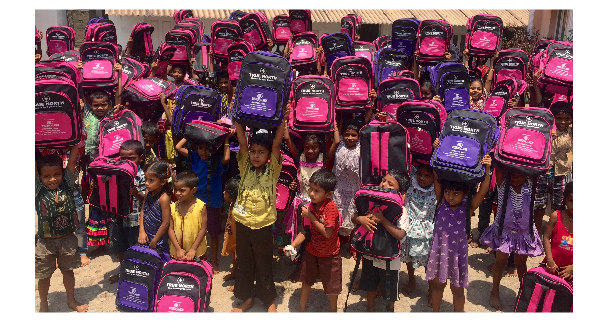 Follow: Helping 1500 Kids to Go back to School In India. I am Joshua Thomas. I am 14 years old and love reading and playing basketball. I love my church - Covenant Church Colleyville- and love serving there. My Dad is a missionary and a humanitarian. He travels to many countries to carry out charitable projects. This year he is giving me an opportunity to go and experience some of the work he is doing in India and be an active part. I am really excited about this opportunity. We will be in India from July 19 for little over 2 weeks. We will be traveling to few places to carry out the following projects. 1. 16 Water Wells.... Wisdom for Asia (our Non Profit Organization) has completed 84 wells so far in India. These wells provides clean drinking water for people who live in the slums, remote tribal villages where there is no access to clean drinking water. We have selected 14 more villages to help over 7000-10000 people. 2. Back to School Project... We will be going to a few Govt. Schools and provide over 1500 Back Packs filled with school supplies. I will also speaking in these gatherigs. My Dad told me that many students quit school each year because they cannot afford school supplies to go back to school. My prayer is that our project will motivate them to continue their school. My Dad is keep telling me that this will be a 2 week non stop traveling and work and is prepping me for it. Even though I am not a fan of that too much travel, but I am really looking forward to be part of this life changing projects. Just to see and experience the gratitude of the people when they recieve the clean drinking water and the smiles of the children who get to go to school another year... WOW.... It is priceless. For this trip, I need to raise $2500 for my round trip air tickets and the air tickets for the travel in India. Also, I wanted to donate 65 back packs ($12 each) to the needy children. So a portion of this amount going for that as well. I went to India in 2013 with my parents and it was truly life changer. Ever since I was looking forward to this opportunity again. Thank you for helping to make my dream come true. Thank you for giving me a chance to go and help so many children. Please donate the best gift amount here. Your gift of any amount will truly make a difference. Also, Please dont forget to share this info with others as well. Most importantly, Please pray for me that I will continue to do God's will. Thanks for your time. God Bless You Josh! May He use you abundantly during this trip and trips to come! I love that you are following in your parents footsteps and being the hands and feet of Jesus in the country of our heritage. God bless you! May the Lord use you. Enjoy the trip. God use you Mightily as you bless many in HIs Name! Hi Joshua! Thank you for serving your gifts, you will make a great impact in the lives of this kids in India, for the Kingdom of God! You are an Agent of Change for the Next Generation! Many blessings to you and your family! Great opportunity! Have a safe trip! You are a blessing fired up and fired out, may the Spirit go before you ! Go with full abandon to serve the Lord! So proud of you Joshua! God bless you as you go on this mission trip!